After Rosa Parks, Autherine Lucy, Vivian Jones and Angela Davis, Anita Hill may well represent one of the seminal activist moments for black women and the rest of America in the second half of 20th century. 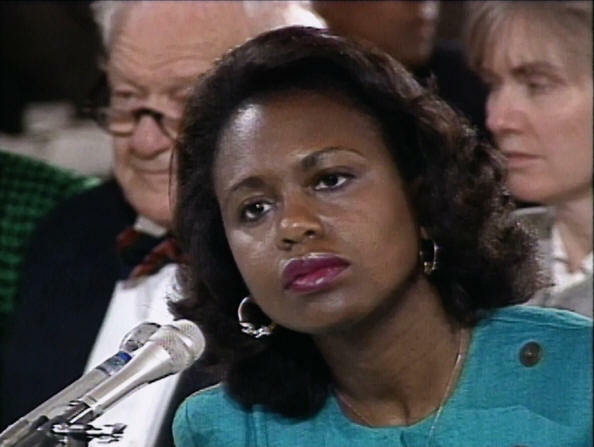 Her testimony during the Clarence Thomas Senate Judiciary Supreme Court justice confirmation hearings in October 1991, in which Ms. Hill accused Mr. Thomas of sexual harassment at the Equal Employment Opportunity Committee, were viewed live on television by millions. Freida Mock's 75-minute documentary "Anita: Speaking Truth To Power" solemnly chronicles that incendiary 1991 spectacle of humiliation for Professor Hill, an accomplished lawyer who continues to teach at Brandeis University. The first 45 minutes of "Anita" focus on the racial and sexual politics of an all-white male U.S. Senate Judiciary Committee's somewhat naive, prurient and accusatory questioning of Ms. Hill, whose allegations were backed up by a polygraph examination she passed. Riveting and uplifting at times, "Anita" is told in Ms. Hill's own words through interviews conducted with her in 2010, the year much of the second half of "Anita" is centered. The film's last half-hour is sobering and moving, an intimate glimpse of the woman behind the prime-time hearing and its scandalous headlines, which preceded the frenzied climate surrounding a stained blue dress. Though "Anita" discusses race (Mr. Thomas's impossible "high-tech lynching" comment and real racial dynamics), the film is remarkably "race-neutral", even though we learn of the racial hatreds Ms. Hill's grandfather suffered in Oklahoma, her native state. Ms. Mock briefly wades into the black woman-black man dynamic present before the Senate Judiciary Committee hearing, a renewed tension evoking some of the harshest and most complex effects of slavery. Harvard professor and lawyer Charles Ogletree, a counselor to Ms. Hill at the hearings, mentions that he was one of her few prominent black male defenders in 1991. Peaceful, calm and leisurely, "Anita" recasts a woman seen largely as a villain in America (before many came around to her defense and support) the way Tawana Brawley was just a few years before. Black women in America are usually the last to be believed on anything, especially accusations made about sexual violence perpetrated against them. Behind that fact lies deep-seated racist sexual stereotypes held by many about black women. Some of those stereotypes persist in many music videos, including in performances by white performers like Miley Cyrus and Lily Allen. Without making her too much of a talisman "Anita" heralds its charismatic, beautiful and wonderfully engaging figure, who gives this important film energy and insight. Aside from her book Speaking Truth To Power, about the turbulence of 1991, Ms. Hill has largely avoided huge spotlights. Most of "Anita" has overtones of class in feel and procedure, though the subject of class is hardly mentioned. Journalists Jane Mayer, an excellent investigative reporter, and Jill Abramson of The New York Times, who together wrote the book Strange Justice, about the Hill-Thomas hearings, are among numerous people interviewed in "Anita". Most memorably though, Ms. Mock's film begins with a bizarre telephone voicemail message left with Anita Hill at 7:30am on a Saturday in October 2010, nearly twenty years after Professor Hill's testimony. The message is from Virginia Lamp Thomas, the wife of the now-Supreme Court justice. "I would love you to consider an apology sometime and some full explanation of why you did what you did with my husband...have a good day." "Anita: Speaking Truth To Power" is not rated by the Motion Picture Association Of America. It contains descriptive sexual language, specifically that spoken in the 1991 hearings. The film's running time is one hour and 16 minutes.